The Best Banana Bread Recipe - My Secret Revealed - Girl, Just DIY! Everyone thinks they have the best recipe for whatever it is their baking. I think it’s human nature to believe what we make is the best. “But you haven’t tasted mine yet,” is usually what we tell each other. Well, I’m certain you’ll be convinced this banana bread is the best you’ve ever tasted. Why? Because I have a secret ingredient I use to get the best tasting banana bread; and I’m going to share it with you. More on that in a bit. If you’ve ever been to Hawaii then you know everyone on the islands claims to have the best banana bread. When we went to Maui several years ago we drove all the way around West Maui Mountain to find the best banana bread, according to our tour book. It’s a long drive but we decided we were ready for the adventure. The narrow road takes you through some beautiful parts of Maui most tourists don’t explore. Honestly the locals prefer to keep it that way but the woman who sells her banana bread loves the tourist traffic. I got this recipe from one of those community cookbooks the ladies groups used to sell. You know, in the days before the internet (am I aging myself just a bit with this statement?). It was my mom’s book and I’ve been baking this recipe for at least 30 years. 30 years!?! Yes, remember, I started baking when I was a youngster 🙂 I add more bananas than the original recipe and salt, because the original recipe didn’t call for salt. 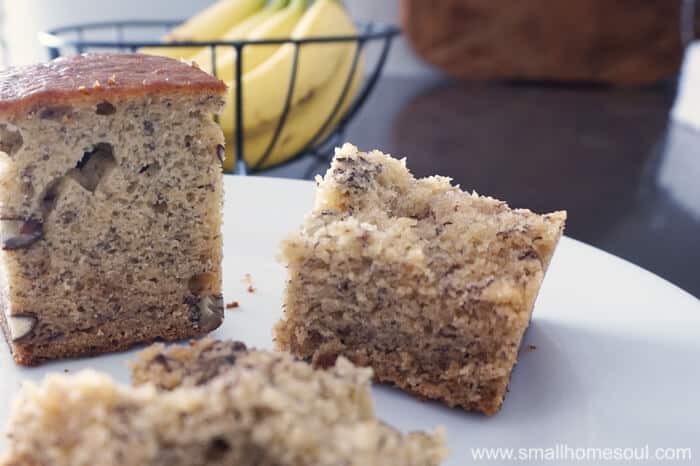 There are a few benefits to making your own banana cake, bread, or muffins. 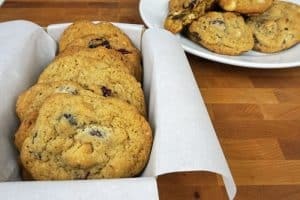 Baking at home is easy on your budget since it costs so much less to make your own compared to anything you buy at a store or bakery. And you know exactly what ingredients are included. No mystery abbreviated ingredients or names too long to pronounce. 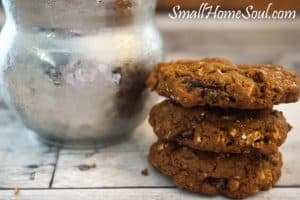 Healthy eating can include homemade sweet treats. This post contains some affiliate links for your convenience. You can read my full disclosure here. Let’s mix it up. Gather all your ingredients and supplies. Cream together the Butter and Sugar, then add Eggs and mix well. Add the Bananas, Vanilla, Baking Soda, and Salt and mix. Gradually mix in the Flour. 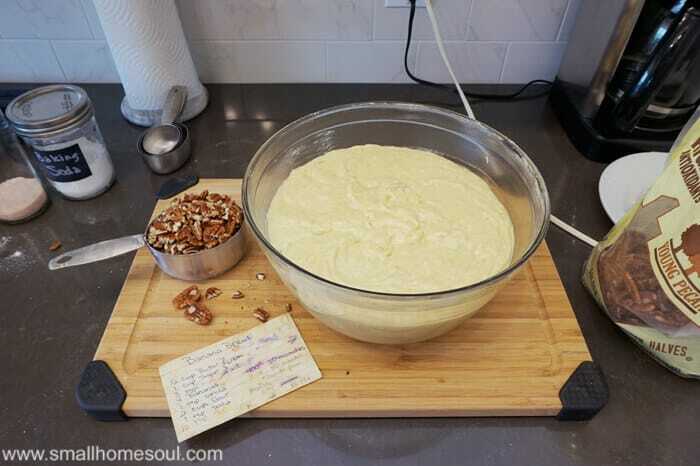 Add nuts last if desired. Pour into a pan prepared with either non-stick spray or use the butter/flour method (I prefer the latter). 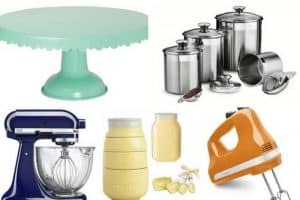 Here are several baking options to choose from, I’ve used them all. Just remember oven temps can vary. The banana bread, muffins, or cake, is done when a toothpick inserted into the center comes out clean. 375 for 35 minutes, then reduce to 350 and cook 20 minutes more. Doesn’t this look the tastiest? I cooked this batch as a double recipe in a cake pan (thus the square shape). We were sharing some with our friends and I needed wanted to have enough for us. Mmmm, check out all the dark banana bits and nuts. It’s making my mouth water. I just might have to make some more today, I know my hubby would be happy. Are you ready for my secret? You might think it’s yucky. Ok, you’ve waited long enough. 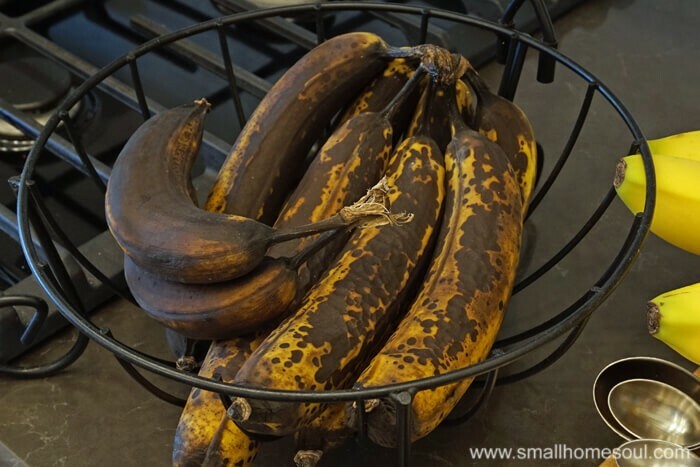 Here’s the bananas I use when I make banana bread. Not the pretty ones you can see on the right. So that’s my secret. 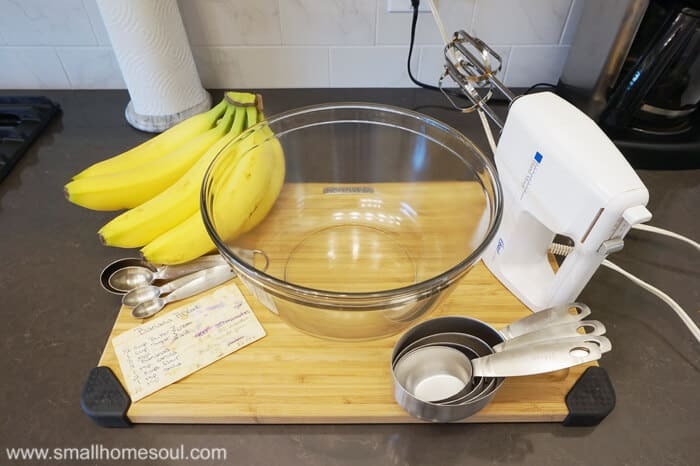 What do you think, are you going to try out my secret ingredient (and maybe my recipe) the next time you make banana bread? I’d love to know what you think about my secret so leave me a comment below. 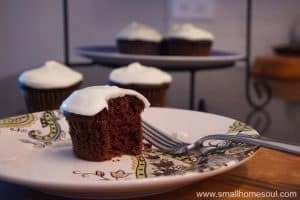 Best Chocolate Cake You’ll Ever Eat! Oh this is so happening this weekend! Your recipe sounds delicious! I use the dark, ugly squishy ones too. Yesterday I made banana chocolate chip muffins and used bananas I had frozen that were dark, but they made the best muffins. Yes Carol, the squishy ones have the best flavor. OOh, I like chocolate chips in mine too and need to do that more often. 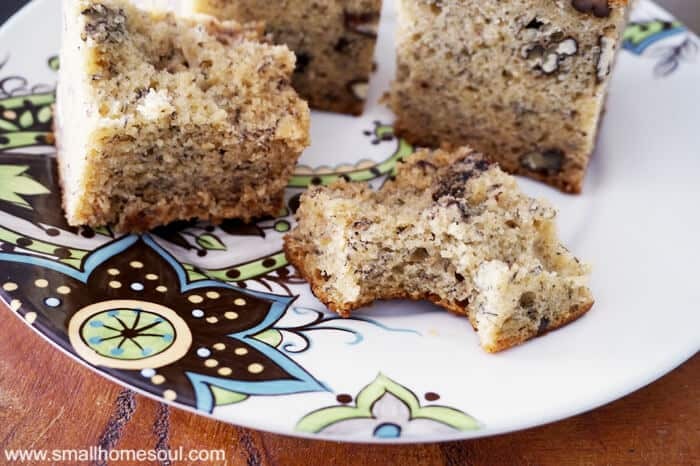 This banana bread recipe looks so yummy. I’ll have to give it a try the next time I have very ripe bananas!!! Thanks so much for the great tip! Janine you will love making it with really squishy bananas. The best flavor ever! Your banana bread looks delicious! 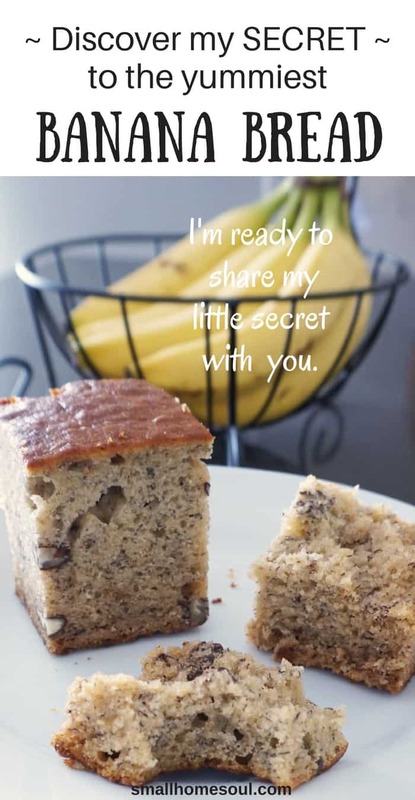 My husband makes some pretty mean banana bread – and his secret is the same as yours ? 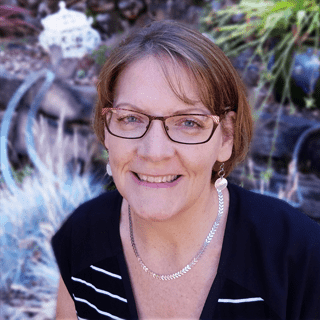 – the blacker and more squishy the better! Thanks for sharing your recipe it looks amazing! I love those old church/community cookbooks. They have the best recipes. We put our bananas in the freezer too. I suddenly have a craving for banana bread. Ooooh I love banana bread!!!! I am going to try this recipe!! I have to first go buy bananas to apoil them ? I know dark bananas work well but never went that dark! Yes, let them sit for several days, I like them even more ripe than what I used this time.